There is nothing more satisfying than belting out your favourite power ballad at the top of your lungs. It never gets old. 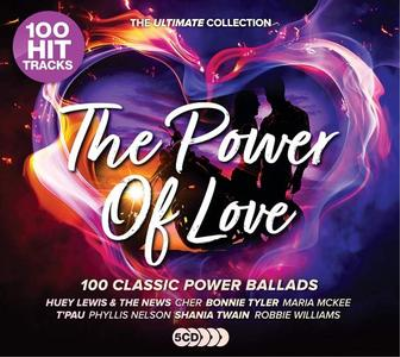 The Power Of Love delivers 100 of the greatest Power Ballads for you listening pleasure, whether you're in the shower, gathering with friends or on a long car journey, we have all the fist pumping favourites on one amazing album. The collection includes some of the best selling power ballads with 40 massive top-10 hit singles from the likes of T-Pau, Huey Lewis & The News, Cutting Crew, Cher, Bonnie Tyler, Marie Mckee, Richard Marx, Asia, the list goes on. The heavier epic rock gems are delivered courtesy of Nazareth, Kiss, Magnum, 10CC, Poison, Rainbow, Rod Stewart, Motorhead plus many more. The album could not be complete without the popular newer hits from huge names like Lenny Kravitz, Maroon 5, Shania Twain, Robbie Williams, Scorpions, Stereophonics, Ronan Keating to mention but a few. Whether you are into the 80s, 90s, Blockbuster movies, Pop, Indie or Rock, this set caterers to all tastes. Enjoy the most irresistible emotionally charged ballads that will resonate forever on this must-have collection. 2. Alison Moyet - Is This Love? 8. 4 Non Blondes - What's Up?